Okayama Castle (岡山城) was built in 1597 by Ukita Hideie, the lord of Bizen Domain. Its Tenshu-kaku and adjacent watch towers are designated National Treasures, as they fully show the sprits of the Azuchi-Momoyama Period with their beauty and grandeur. Okayama Castle is also known as "Ujo" (Crow Castle), stemming from the black exterior of the Tenshu-Kaku. This is due to the dark weather boars covering the castle's outer walls. Closed on New Year's days. Okayama Castle was built in 1597 by Ukita Hideie. Hideie was one of Five Dairo of Toyotomi Government. He designed this castle in the motif of Azuchi Castle. THe basement of Tenshu-kaku figures pentagon which is very unique. This time, the technology of building castle had been improved dramatically, and all great Daimyo including Toyotomo Hideyoshi built giant castles, such as Osaka Castle. Okayama Castle is one of those giant castles built in the end of 16th century. The baileys extend to only west side of Honmaru. Okayama Castle use Asahi River as the protection of the Honmaru. The river runs S shape which protect north, east and south side of Honmaru. Korakuen-garden was also built as the bailey of Honmaru. The first Okayama castle was built in middle of 14th century. In 1570, when Ukita Naoie became Sengoku Daimyo, the feudal lord of Bizen, he moved his capital from Kameyama castle to Okayama Castle and built his castle town in current Okayama city. It is 20m tall, three layered six stories building. Just like Azuchi Castle, there is living space for the feudal lord in Tenshu-Kaku. For the fireproof, the wall was painted with Japanese lacquer. Therefore, the Tensh-Kaku was colored in black. 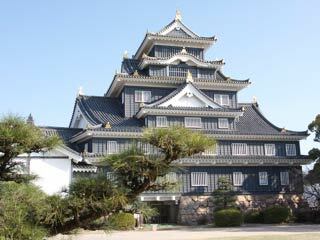 Because of its black color, Okayama castle was also called "Ujo" (Crow Castle). The original Tenshu-Kaku remained until WWII. It was burnt down, and reconstructed in 1966. ... is a keep built by 4th lord Ikeda Tadakatsu. This Keep remains since Edo Period, and designated as the important cultural asset of Japan. This gate was at the bottom of a flight of stone steps, which led to Hon-den, the fudal lord's residence) on the highest level from the southern end of Omote-Shoin (the feudal government office) on the middle level. It was the large castle gate to guard the entrance of Hon-den including Tenshu-kaku. Instead of this gate, the roofed passage of the northern end was commonly used. Therefore, this gate was so called because it would not open for daily use. Though the gate was demolished after the abolishment of castle in Meiji era, it was reconstructed in reinforced concrete in 1966.